Aphelion - The point in an object's orbit when it is the furthest from the Sun. Apogee - The point in an object's orbit when it is the furthest from the Earth. 1' = 60" (arcseconds) or 1" is 1/60th of an arc minute (1/3600 of a degree). *Great circles in the sky include the horizon, the celestial equator (a projection of the Earth's equator onto the sky), the ecliptic (apparent path of the Sun, Moon and planets across the sky) and the meridian. Jupiter when closest = 50"
Mars when closest = 25"
Asterism - A special grouping of stars that are part of a constellation. These stars form recognizable figures in the sky. An example would be the Big Dipper. It is made up of stars in the constellation of Ursa Major also known as the Great Bear, but there are more stars in that constellation that are not part of the Big Dipper. Asteroid - One of the many thousand chunks of rock or iron that orbit the Sun, less than 620 miles (1,000 kilometers) across, also known by the older term, minor planet. Most asteroids orbit between Mars and Jupiter, where they formed; but some cross the orbit of Earth. See Name That Space Rock chart. Astronomical unit (AU) - This is a standard unit of measure to represent the distances of objects within our solar system from the Sun. One AU is the distance from the Earth to the Sun ... 93 million miles or 149,597,870 kilometers. Azimuth - This marks the horizontal position on the great circle of the celestial sphere. Exact North = 0°, exact East = 90°, exact South = 180°, exact West = 270°, exact North = 360° (or 0°). Bolide - A very bright meteor which fragments or explodes. Sounds of the explosion can be heard if the observe is close enough. Celestial Equator - A great circle that is a projection of the Earth's equator onto the sky. It always intercepts horizon at exact east and exact west point. Its meridian altitude, 90 degrees, is the observer's latitude. We see one-half of its circle at a time (12 hours worth). Celestial Pole - Either of two diametrically opposite points at which the extensions of the earth's axis intersect the celestial sphere ... north to a point about 1û from Alpha Ursa Minoris (Polaris), and south to a point about 1û from Sigma Octantis (a fairly dim star sometimes called Polaris Australe). Often referred to as the north pole or south pole. The tilt of the Earth's axis causes the celestial pole above our planetary pole to describe a great circle in the sky over long periods of time. In 4500 BCE, Thuban, a star in the tail of Draco, marked the celestial north pole. This pole has, over time, shifted to Polaris and in about 12,000 years will shift to Vega! Celestial Sphere - An imaginary sphere of extremely large size around the Earth on which the stars appear to be placed. Comet - A small, frozen mass of rock, dust and gas revolving around the Sun in an elliptical orbit. As it nears the sun it usually brightens and develops a gaseous halo, or coma, and a tail of gas and dust. Comet tails point away from the Sun. See Name That Space Rock chart. Conjunction - A time when two or more bodies appear close together in the sky. Astrologers consider this to be the strongest and most influential relationship (aspect) celestial bodies can have. Culmination - The position of a heavenly body when at highest apparent altitude. To reach the highest point above an observer's horizon. Declination - This is the the number of degrees an object is north or south of the celestial equator. A declination of +20° means the celestial object is located 20° north of the celestial equator. The south polar cap is at a declination of –90°, the equator is at declination 0°, and the north polar cap is at a declination of +90°. Declination is to a celestial globe as latitude is to a terrestrial globe, a vertical positioning of an object. 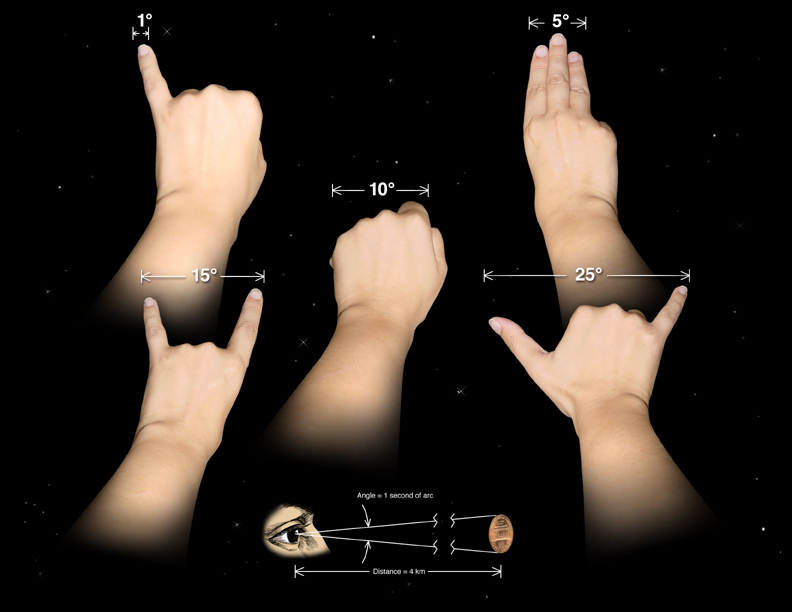 1º is about the width of the little finger. 10º one width of your fist. Of course these are rough measurements. Enjoy using them, while navigating the heavens! Earthshine - Also known as the Moon's "ashen glow" or "the old Moon in the New Moon's arms" is actually sunlight reflected from the day side of our own planet onto the Moon's surface. (Earth's clouds do most of the reflecting.) An earthshine Moon is a brightly glowing slender Crescent Moon joined with the pale grayish glow of the nearly full "dark" side of the Moon. Earthshine is best seen the third day after the New Moon and during the months of April and May. Eclipse - The hiding or blocking of one celestial object by another. Ecliptic Pole/Center - The ecliptic plane passes through the 12 zodiacal constellations. The ecliptic's axis currently extends north to the north ecliptic pole, a point in the constellation Draco, and south to a point in the contellation Dorado we call the south ecliptic pole. The ecliptic pole unlike the celestial pole does not change. Elongation (Greatest) - The apparent greatest angular separation (visual distance) of an object from the Sun as seen from the Earth. The inferior planets, Mercury and Venus, are best viewed at their greatest elongation, Mercury between 18º-28º and Venus between 45º-47º. Image At their "greatest eastern elongation" they appear east of the Sun at night, above the sunset (western) horizon. At their "greatest western elongation" they appear west of the Sun in the morning, above the sunrise (eastern) horizon. Image After greatest elongation Mercury and Venus sink back toward the horizon. Note: Altitude refers to degress above the horizon, while elongation refers to degrees from the Sun. Fireball - A meteor which is brighter than any planet or star. Globular Cluster - A spherical cluster of hundreds of thousands to millions of very old stars. The orbits of most globular clusters are very elliptical and oriented in random directions. Inferior Conjunction - The configuration of an inferior planet (Mercury, Venus) when it lies between the Sun and Earth. Image During this time the planet lost in the solar glare, is switching horizons from the sunset evening horizon to the sunrise morning horizon. Astrologers consider a conjunction to be the strongest and most influential relationship (aspect) celestial bodies can have. Inferior Planet - A planet that orbits the sun inside of Earths orbit ... Mercury and Venus, also known as an inner planet. See superior planet. Light Year - The distance between stars and galaxies in the universe is so vast it would be unwieldy to describe it in miles - like measuring the distance from New York to Tokyo in inches! Instead, scientists use light-years to measure distances in space. This sounds like a unit of time, but a light-year is actually a distance: the distance that light travels in one year. But how far exactly is a light-year? A ray of light travels 186,000 miles per second. There are 60 seconds in a minute, 60 minutes in an hour, 24 hours in a day, and 365 days in a year. Multiply these together to get 31,500,000 seconds in a year. Multiply that times 186,000 miles per second and you get 5,850,000,000,000 miles - about 6 trillion miles. Local Time - Represents the time of the reader, and the local time given on this website should be no more than about 30 minutes off for most of the people in the world. Magnitude (apparent magnitude) - The degree of brightness of a celestial body as seen from the Earth designated on a numerical scale, on which the brightest star has magnitude 1.4 and the faintest visible star has magnitude 6.0 to 6.5, with the scale rule such that a decrease of one unit represents an increase in apparent brightness by a factor of 2.512. Negative magnitudes are reserved for the most brilliant objects: the Full Moon is 12.7; the Sun is 26.7. 25 Brightest Stars Note: Over the entire celestial sphere there are 8,479 stars within the 6.5 magnitude limit. Meridian - This is an imaginary great circle on the sky that goes through the celestial north and south poles, the zenith (highest point overhead), and the nadir (the point opposite the zenith below the observer). It separates the daytime motions of the Sun into "a.m.'' and "p.m.'' marking the noon position of the Sun. It also marks the midnight point of the heavens, when "p.m." changes into "a.m.". The azimuth of an object on the meridian in the northern sky = 0° and the azimuth of an object on the meridian in the southern sky = 180°. Meteor - Popularly called a "shooting star" or a "falling star," a meteor is actually an object usually ranging from the size of a dust particle to a rock that enters Earth's atmosphere, and is heated by the friction of air resistance. Most meteors originate from comets. It's best to see meteors in the predawn sky because the Earth circles the Sun, dawn side first. The dawn side of Earth is similar to the windshield of a car, which slams into wind, rain, snow and even bugs first. See Name That Space Rock chart. Meteorite - A meteor that is large enough to survive its passage through the atmosphere and hit the ground as a mass of metal or stone. Asteroids are the source of most meteorites. See Name That Space Rock chart. Meteor Shower - A shower of meteors occurs when Earth's orbit intersects the orbit of a comet or its debris and produces a number of shooting stars over a specific period of time. Meteor Storm - This is a rare event that occurs when Earth encounters closely grouped meteors within the orbit of a comet or its debris. Such events can see meteor rates exceeding 1000 per minute. Milky Way - The spiral galaxy containing our solar system. Visible from Earth as a broad band of faint light in the night sky. Monthly Milky Way The archer of the constellation Sagittarius points the direction to its center, the galactic center, the heart of our galaxy. A new Milky Way map was created June 3, 2008. New Moon - This phase occurs when the Moon lies between the Sun and Earth. The side facing the Sun is sunlit, while the side facing the Earth is not lit by the Sun. This alignment leaves the Moon dark and invisible to us. The New Moon phase is also called the "dark of the Moon" when the Sun and Moon are exactly conjunct. This is the time when our soul goes into deep meditation and aligns with the inspiration of the Nirmanakayas. A new cycle begins and what is conceived at this time occurs deep within our being. A potential is enlivened and the seed is formed. The New Moon transits about the same time as the Sun ... it rises and sets with the Sun. Waxing Crescent - This phase occurs when the visible Moon is partly but less than one-half illuminated by direct sunlight ... the illuminated part is increasing. What was conceived at the New Moon begins its process of waxing or gestating. The Sun provides the increasing light of awareness and fuel for the process. Obstacles from the past might arise to impede this growth in consciousness. The work to overcome these obstacles begins now. The waxing Moon transits less than 6 hours after the Sun. It rises in the east after sunrise and before noon. It is seen in the southern sky after 12 noon and in the western night sky just after sunset appearing higher in the sky with each successive evening. It sets before midnight. First Quarter - This phase occurs when one-half of the Moon is illuminated by direct sunlight ... the illuminated part is increasing. The Moon squares the Sun. This Moon signals the balance between light and dark ... moving toward the light. During this time a continued awareness of that which was conceived at the New Moon is gained. Ideally any obstacles impeding this awareness are overcome at this time. This must happen if the energy released with the coming Full Moon is to be utilized. The First Quarter Moon transits 6 hours after the Sun. It rises in the east at about noon, appears in the southern sky at sunset and sets in the west 6 hours after the Sun around the midnight hour. the illuminated part is increasing. Illumination and growth are offered during this Moon phase, only if the obstacles from the past are cleared away. Patterns set at the First Quarter Moon, whether characterized by a growing consciousness or restricted by old entanglements, will continue to develop throughout this phase. The waxing Gibbous Moon transits more than 6 but less than 12 hours after the Sun. It rises in the east after 12 noon and before sunset. It is seen in the southern sky after sunset and before midnight and sets after midnight and before sunrise. Full Moon - This occurs when the visible Moon is fully illuminated by direct sunlight. At the Full Moon the Sun and Moon are in opposition. The light of the Sun reveals the fullness of what was conceived at the New Moon or "dark of the Moon." The seed, potential of that conception, now comes to fruition and is birthed into the full light of our conscious minds. If a positive attitude toward growth has been developed and the restrictions of the past have been released during the waxing Moon, then the Full Moon can bring fulfillment. If a negative attitude has dominated during this period of increasing light, then the Full Moon might bring serious mental conflicts, possibly affecting the physical body. The Full Moon transits 12 hours after the Sun. It rises in the east as the Sun sets in the west, appears in the southern sky around the midnight hour and sets in the west at sunrise. Waning Gibbous - This phase occurs when the Moon is partly but more than one-half illuminated by direct sunlight ... the illuminated part is decreasing. Ideally this phase brings illumination to the influences of the entire lunar cycle. If not, dis-ease results. The Waning Gibbous Moon transits more than 12 and less than 18 hours after the Sun. With each successive night after the Full Moon, the waning Moon rises in the east about 48 minutes later until it is rising in the early morning hours. (Some prefer using 1 hour rather than 48 minutes in approximating the moonrise.) It appears in the southern sky before sunrise and sets in the afternoon. Last Quarter - This phase occurs when one-half of the Moon appears illuminated by direct sunlight ... the illuminated part is decreasing. The Moon squares the Sun. This Moon can bring a crisis in consciousness. This cycle's experiences have culminated and one must now prepare for rebirth. The Last Quarter Moon transits 6 hours before the Sun. This Moon rises in the east in the early morning hours, appears in the southern sky at sunrise and sets in the west 6 hours before the Sun. Waning Crescent - occurs when the Moon is partly but less than one-half illuminated by direct sunlight while the illuminated part is decreasing. This is a time for conscious growth as the Moon dissipates its collected solar potential. Enlightenment at a deep level brings clarification of conscious values. Rebirth can occur. The Waning Crescent Moon transits less than 6 hours before the Sun. It rises less than 6 hours before the Sun, appears in the southern sky less than 6 hours before noon and sets less than 6 hours before the Sun. Nadir - This is the point on the celestial sphere directly opposite the zenith, the highest point above the observer. The nadir is the lowest point on this sphere, located directly below the observer. Nova - A star which suddenly flares up to many times its original brightness before fading again. Occultation - The passage of one object in front of a smaller one, temporarily obscuring all or part of the background object from view. Open Star Cluster - A system containing a few dozen to a few thousand stars that formed from the same stellar nursery. List of Open Clusters Also see Star Cluster in this glossary. Opposition - The moment when a planet appears exactly opposite the Sun in the sky. At this time the Earth lies directly between the Sun and the planet and all three celestial bodies form a straight line. It is the best time to observe a planet because it is seen in the night sky from sunset until sunrise and it is in a close proximity to Earth, appearing bigger and brighter. Note: This orbital lineup can only occur with an outer superior planet, one that is farther from the Sun than Earth. Perigee - The point in an object's orbit when it is the closest to the Earth. Perihelion - The point in an object's orbit when it is the closest to the Sun. Prograde (Direct) Motion - The normal forward eastward movement of a planet around the zodiac. See Retrograde Motion below to understand the opposite westward motion of a planet. A planet is stationary direct when it is switching from retrograde motion to prograde motion. During quadrature the shadow of Saturn’s globe is cast well off to its eastern or western side, giving the planet and its rings a greater depth in appearance. The shadow of Jupiter at quadrature eclipses its moons. Jupiter’s closest moons, Io and Europa stay hidden longer, within the shadow and behind the planet's disk. Ganymede can be seen entering and leaving the shadow. Callisto, the most distant moon, may miss the shadow. Radiant - The point from which meteors appear to eminate in the sky. The apparent source of shooting stars. Retrograde Motion - Every so often, each planet ceases its normal forward eastward movement around the zodiac (called direct or prograde motion) and appears to move backwards westward (called retrograde motion) for a time. For the outer planets (Mars, Jupiter, Saturn, Uranus, Neptune) this occurs whenever the Earth passes up the other planet as they both orbit the Sun, similar to how a slower car appears to move backwards when you pass it at higher speed on the highway. For the inner planets (Venus, Mercury) it occurs when they orbitally pass up the Earth. After a time, the planet stops this reverse motion and resumes its normal, direct motion, again. Image: Outer Planet ... Image: Inner Planet ... Interactive Image A planet is stationary retrograde when it is switching from prograde motion to retrograde motion. The region between the direct and retrograde stations is called the retrograde zone. Royal Stars - 4 of the 25 brightest stars, Aldebaran (14th), Regulus (21st), Antares (15th), Fomalhaut (18th). According to Persian astrologers (3000 BC), "four Royal Stars" were pointing to the four directions of space, marked by the equinoxes and solstices. Note: The Persian position for Regulus (south) and Fomalhaut (north) has caused confusion. Modern usage has flipped these positions due to their seasonal/directional associations. Saber's Beads - Very young and old Lunar crescents- prolifically within 24 hours of New Moon- exhibit the phenomenon known as Saber's Beads. Image The rare necklace of staggered brightness peaks seen along very thin crescents is reminiscent of the beautiful "string-of-pearls" effect seen near 2nd and 3rd contacts during a total solar eclipse. 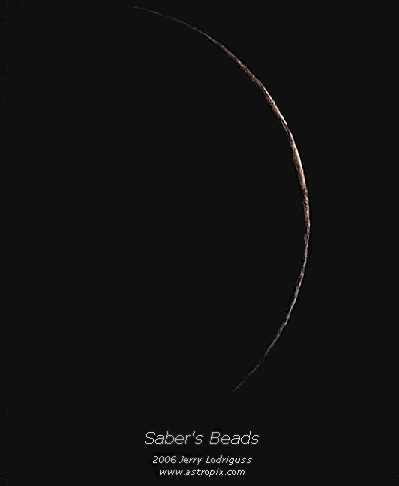 American musician and astronomer Stephen Saber, namesake of the phenomenon, offers more information on Saber's Beads and spotting extreme crescents at his website. Solar System - This is the description given to the system dominated by the Sun and including the planets, minor planets, comets, planetary satellites and interplanetary debris that travel in orbits around the Sun. Sunspot - Cooler region on the Sun's surface that is a region of intense magnetic fields and is associated with solar activity. Because a sunspot is 1000 to 1500 K cooler, it is dimmer than the surrounding surface. The number of sunspots is greater when the Sun is more active. 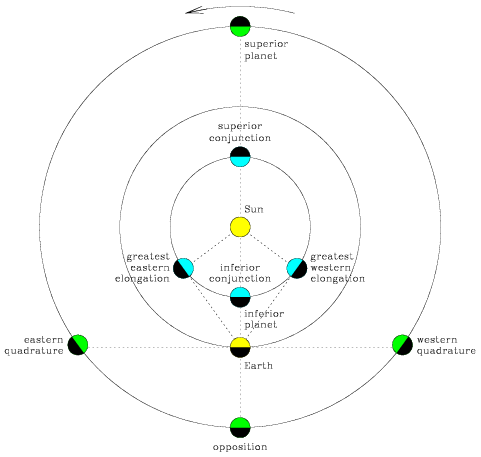 Superior Conjunction - The configuration of an inferior planet (Mercury, Venus) when it lies on the far side of the Sun. Image During this time the planet lost in the solar glare, is switching horizons from the sunrise morning horizon to the sunset evening horizon. Astrologers consider a conjunction to be the strongest and most influential relationship (aspect) celestial bodies can have. Superior Planet - A planet that orbits the sun outside of Earths orbit ... Mars, Jupiter, Saturn, Uranus, Neptune, also known as an outer planet. See inferior planet. Syzygy - Pronounced (siz-i-jee). Describes a situation in which three or more astronomical bodies, in a gravitational system, are aligned in a roughly straight line. People most commonly use this term to talk about the relationship among the Sun, Moon, and Earth at a New Moon or Full Moon; syzygy affects the tides on Earth. Solar and lunar eclipses occur at times of syzygy, as do transits and occultations. It is also used to describe situations when all the planets are on the same side of the Sun, although they are not necessarily found along a straight line. Zenith - This is the point in the sky directly above the observer. It is the highest point on the celestial sphere directly opposite the nadir, the lowest point on this sphere.